Home | Serigraphs and Giclee Fine Art | Joanne Netting | Joanne Netting Limited Edition Serigraph on Paper: " Tropical Rainforest "
Joanne Netting Limited Edition Serigraph on Paper: " Tropical Rainforest "
About the Art: Inspired by visions of an idyllic world, Joanne Netting is an artist who is well able to transport the viewer to a world which has links to reality, yet is unfamiliar and exotic. This altered reality has been adjusted and amplified to reflect a new and superior scene of perfection and peace. Citing the pure and innocent pleasure of a child as the emotional tone for her work, Netting uses this perspective when creating her works of tropical inlets, parks, verandahs overlooking turquoise bays, tranquil farms and restful interiors. The simple goodness of life is the focus of Netting's work. Each inviting scene is skillfully simplified with the clarity, order and balance dictated by the artist's intuitive sense of composition and design. Born in Australia in 1963, Netting evolved as a self-taught artist tapping into talent she credits her mother with recognizing at an early date. Encouraged by her mother, and inspired by a myriad of artists, Netting found herself immersed in creating drawings and paintings. Showing work locally while still in college, Netting soon graduated artistically with a solo exhibition during which all paintings included were sold. The tremendous enthusiasm generated at the premier exhibition gave Netting a great artistic boost. Drawing from memory refreshed occasionally by photographs, Netting is most profoundly influenced by the lush coastline of Australia. The warmth of the climate permeates all of Netting's works, bathing the finished piece in a glow that captures life's vitality reverberating in natural and artificial environments. 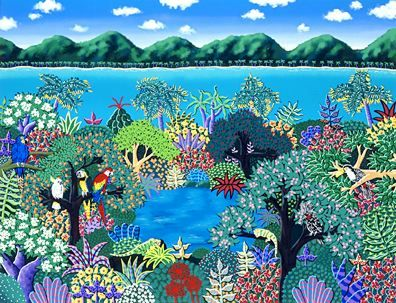 Home | Fine Art Prints & Limited Editions | Gallery Direct Art is your Authorized Chalk & Vermilion Dealer | Joanne Netting | Joanne Netting Limited Edition Serigraph on Paper: " Tropical Rainforest "